When you need roofing in Mason, TX for an affordable price, do you know who to contact? For dependable roofing, you can count on ECO Commercial Roofing at (833) 200-0571 to help you out! We can assist you with any kind of roof service, and our team is committed to customer service at all times. We have been business and residential roof contractors in the Mason area for decades, and our professionals are established members of our community. Our roofers are very knowledgeable on the various types of roofing, and we’re happy to help you with any of your roof questions or concerns. Finding a reliable roofing contractor is always easy when you count on ECO Commercial Roofing! Your roof plays a significant role in defending your house, so it is of the greatest importance that you have a roofer you can trust. We make sure that all of our roofers are taught to the industry standards, and we only purchase materials from contractors we can trust, like Conklin. Since the type of roofing you install can affect the value of your property in years to come, we are sure to stock large selections of materials and styles for you to choose from. Everyone likes an especially stylish roof, but make sure to look at all of the long term perks involved, too. The type of roof you pick will ultimately depend on your budget, as well as the type of building you are needing to protect. Luckily, our crew can provide you with plenty of options. No matter what your requirements are, from repairs to replacements, our mission is to help you get precisely what you’re looking for. Regardless of which kind of roofing service you need, from commercial, to residential, or even industrial, we provide the services you need. Our commercial roof offerings are designed to cater to business owners who have low-sloped or flat roof systems. Ponding and leaks are both common with flat roofing, but an expert installation is the first step in entirely avoiding problems like those. Industrial roofs, while similar to commercial roofs, actually require stronger materials, and extremely skilled installation to guarantee longevity. For homeowners, we additionally offer a selection of cost-effective residential roof styles that are sure to accommodate your needs! Roof restorations are our primary specialty, meaning we are no strangers to roof coatings. In our experience, utilizing top quality materials like Conklin can really make the difference between the roof coating that lasts, and one that does not. In order to deliver top of the line roofing in Mason, TX, our team works hard to deliver unbeatable customer satisfaction, with the assistance of detailed craftsmanship and expertise. If you’re interested in learning more about how roof restoration with Conklin products can extend the life of your roof system, give us a call now at (833) 200-0571, or look into the links below! As specialists, we often recommend roof restoration to our clients as a method of repairing your roof and defending it from additional damages. Your building’s roof can go on for an additional ten years with the assistance of one of our Conklin roof coatings. Save both time and money by picking a reliable roof restoration instead of a roof replacement. 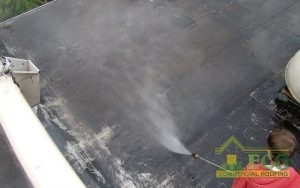 Commercial Roofing A commercial restoration is less expensive than a complete replacement, and often just as effective. 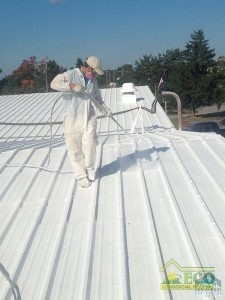 The majority of our roof restorations are completed utilizing Conklin’s high quality roof coating materials. These coatings are available in a selection of varying materials, and we are able to help you determine which one will work best for your requirements. Various coatings deliver different levels of adhesion, flexibility, and moisture resistance. The majority of roof coatings can also apply directly over your installed roof! Call us at (833) 200-0571 today to request an inspection! Acrylic Roofing Alternating temperatures require reliable roof coatings such as acrylic, which are very flexible. Elastomeric Roofing Reliable protection is simple to find with any type of elastomeric roof coating. Our flat roofing services are designed to help out various different types of commercial roofing, including low-slope as well as flat roofs. If you’re looking to skip issues with your roofing, it is essential to begin with a top quality installation. If you need your building’s roofing solution to work efficiently, and endure for a long time, our contractors are here to help. Residential and commercial roof services from ECO Commercial Roofing are dependable and cost-effective. You can ask for our resilient roofing in Mason, TX, as well as the surrounding areas. Spending money on a quality roof system for your building will undoubtedly benefit you later on in that business. To discover how we can serve you best, give us a ring at (833) 200-0571 and set up your expert roof assessment now!